On Tuesday, April 25th, Palestinian American icon Rasmea Odeh will be joined in a Detroit courtroom by supporters from across the Midwest. There, Judge Gershwin Drain will consider the plea agreement Rasmea signed in March, which ended a three-and-a-half-year legal battle against immigration violation charges brought against her. Rather than risk 18 months or more of imprisonment, and the possibility of indefinite detention by Immigration and Customs Enforcement (ICE), Rasmea will plead guilty to Unlawful Procurement of Naturalization, lose her U.S. citizenship, and be forced to leave the country. However, she will exit the U.S. without serving any more time in prison or ICE detention, a victory considering the government’s sought after sentence of 5-7 years. Rasmea’s lead defense attorney Michael Deutsch and his team immediately filed a motion in response, denying any of the “facts” alleged by Tukel, and accusing the government of political posturing. Judge Drain has not yet ruled on either filing. The 69-year old Rasmea was tortured and sexually assaulted by the Israeli military in 1969, and spent 10 years imprisoned by the Israelis, until she was released in a negotiated prisoner exchange. Years after her release, Rasmea came to the U.S. as a permanent resident to care for family, later becoming a naturalized citizen and making a home for herself in Chicago. When she was indicted in 2013, almost 20 years after she arrived here, the government claimed that Rasmea’s immigration documents were not in order. The case against her was never about immigration; it was always about attacking the Palestine liberation movement. In her 2014 trial in U.S. federal court, where Rasmea was convicted and sentenced to 18 months in prison for allegedly giving false answers to questions on her applications for permanent residency and citizenship, Judge Drain barred the defense from challenging the legality of the 1969 Israeli military tribunal. Rasmea was not allowed to explain that she suffered from Post-Traumatic Stress Disorder as a result of the torture, but she won an appeal and a new trial expressly based on the excluded torture evidence. The crimes of Israel would have been part of that new trial. 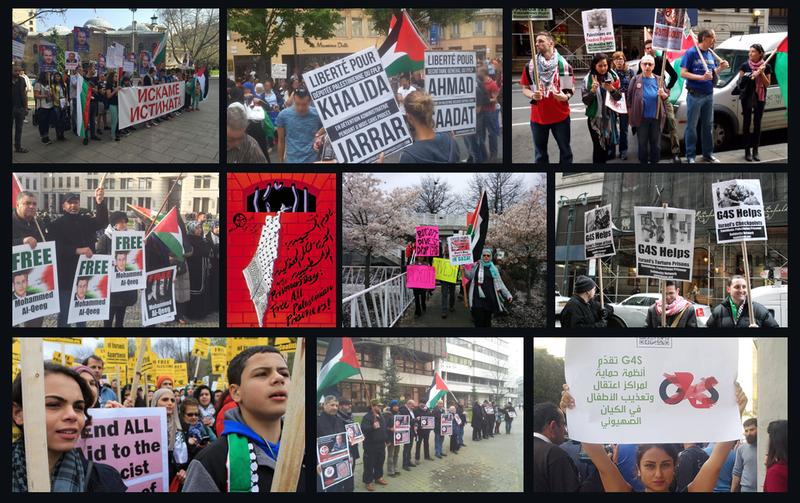 Tens of thousands of people across the U.S. have rallied in support of Rasmea over the past three-and-a-half-years, including many organizations and individuals within the Movement for Black Lives, the anti-torture movement, and the sexual assault survivors’ movement, respectively. She is embraced by the women’s rights movement as well, having been celebrated on International Women’s Day this year. And over 1,000 members of Jewish Voice for Peace gave her repeated standing ovations at their national member meeting in Chicago earlier this month. Hundreds of these supporters from Chicago and other parts of Illinois, as well as from Milwaukee, Detroit / Dearborn, Grand Rapids, Ann Arbor, Minneapolis / St. Paul, Ohio, Indiana, and other Midwest areas are already committed to stand with Rasmea at the Tuesday, April 25th hearing, and rally with her outside.